Our staff tester started out using the stylish Tritan water bottle for a standalone product review, but stumbled upon the fact that it fits perfectly inside Bulletin Bag’s Folding Lunch Bag! She decided to do a joint review since ultimately she tested both items together. The h2go Mali Tumbler with Straw was “fabulous, and the 25 ounce size is great for providing me with all the drink I needed without having to make a few trips to the faucet!” Coming off of a few insulated bottle reviews, it was an adjustment to shift to a Tritan water bottle, and she commented that as a single-wall tumbler, this one is suited for cold beverages only. She also commented, “Don’t you just hate when you’re slurping your straw to get at the bottom of your bottle? Well, this one’s flip-up drinking straw reaches to the very bottom of the tumbler!”. If you look around at your other straw bottles, you might discover that this isn’t as common as you’d think! The Folding Lunch Bag is “equally as awesome, and perfect for toting daily. Once you’ve eaten up what you are carrying in it, just fold it up and easily store it in a bag to take back home”. For more on this bag, read this review. If you’re looking to pair a few items together as an appreciation gift, fundraiser, or awareness campaign, the h2go Mali Tumbler with Straw and a custom lunch bag are an easy fit! 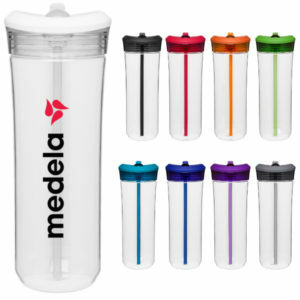 SHOP OUR h2go Mali Tumbler with Straw!